This is not book-related, but it is inspiring. At least to me. And as I find myself frequently sucked into the vortex of bad news, campaign feuds, and headlines of racism, sexism, and other -isms of hatred, I find I need these kinds of inspiring stories. So shared here without apology and without relevance to any of my typical content. 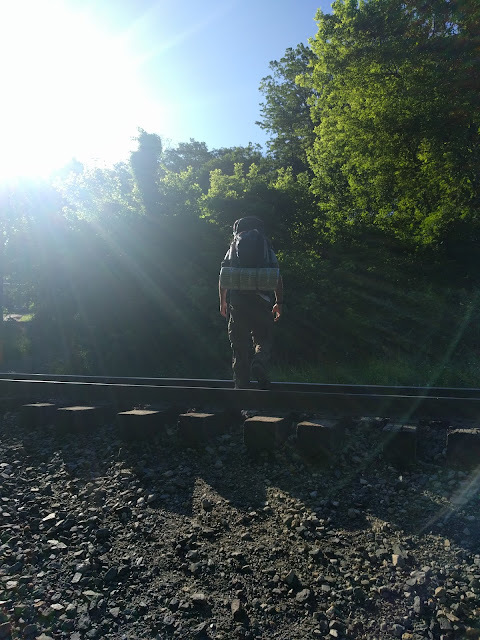 Taken on the AT when I dropped my brother off at the MD/PA line to start his first solo hike of the trail. Karl Meltzer is currently through-hiking the Appalachian Trail (AT). This isn't even Meltzer's first through-hike of the trail. He completed the full trail in 54 days (that's roughly 40.5 miles per day) in 2008. And this time, he's aiming to complete the entirety of the trail (2,190 miles) in 46 days (an average of 47.6 miles per day) in order to beat the current fastest known time (FKT) for an Appalachian through-hike. As of this writing, Meltzer is in Tennessee, 1810.2 miles from his departure point and just 379.8 miles from the other end of the AT. He has 4 days and 23 hours remaining to beat the current FKT. This morning, Meltzer was joined by Scott Jurek (famed ultrarunner, author of Eat and Run**) who just so happens to be the man who holds the current record for a through-hike of the AT. Scott Jurek, current record holder, is currently serving as support crew for Karl Meltzer in Meltzer's quest to beat Jurek's own record. I've always found it inspiring to watch athletes compete for the unimaginable (this is why we all watch the Olympics, no? ), but even more so when an athlete is setting out to reach a big, hairy goal (this is why I get all emotional watching the finish line of marathons). Meltzer's intent to run/hike the AT in under 46 days is, to me, the epitome of big, hairy goals. But as much as I love those big stories, I'm always more drawn to the stories of small wins, the kind that tend to be overlooked (like the NYC Marathoner who gave up her own time goal to help a broken wheelchair team get to the finish line). So whether or not Meltzer reaches his goal, I'll be forever impressed by the teamwork between Meltzer and Jurek on this journey. And the next time I find I'm just a little bit jealous of someone else's work, someone else's success, someone else's better-than-me, I'll remember what it looks like to lift each other up instead of tear each other down. You can follow along on the last few days of Meltzer's trek on his Facebook page or website. *For more fun facts about the Appalachian Trail, and what it takes to through-hike that monster, check out this REI blog post. **See, look, I even managed to make this nominally book-related. I can make it even more book-related by encouraging anyone who finds this kind of thing interesting to check out Robert Moor's excellent book, On Trails, which explores the trails of our world and how they've both shaped and been shaped by humans upon them.